Carefully “wall off” all confidential information— Have management be certain that private information such as health records, are encrypted and separated from operating data that may be considered public in a nonprofit environment. Review Director and Officers (D&O) and other liability policies— Determine whether or not the D&O policy protects directors and managers from cyber security (CS) intrusions. (It likely does not, but I understand that some carriers may offer some protection along with smaller policies.) It is clear that most general liability policies do not protect the organization against CS. Board Encouragement— Devote some meeting time, perhaps 10 minutes, to a discussion of the CS topics so that management and staff are aware of the board’s concerns on the subject and will take action when necessary. Appropriate due care actions like frequent password changes should become routine. Some checklists are available online, suggesting questions directors might pose to raise awareness on the topic and avoid potential CS breaches. Can third party payer help?— Many nonprofits deal with third party payers with sophisticated CS systems and may offer the nonprofit some advice or assistance. Education and training of employers— Many CS crimes have been successful because employees have violated or forget to effectively protect their working accounts and information. Proper education and training can help reduce these types of lapses. You must be secure, if not there are ramifications that could occur if a breach does occur such as major lawsuits and a distrust of your organization. When your organization collects data from clients or donors you are being entrusted with that data. It is your responsibility, as an organization to make sure that trust isn’t broken by being clear with why you are acquiring the information and how your organization will be protecting the information as best you can. Google is the king of search engines. Your website’s ranking can make or break your online presence. But how do you stay or get to the top of the all-powerful Google search result list? SEO of course! But if your organization is relatively new to the digital world, how can you let your online presence be known? That’s where Google’s commitment to non-profits comes in with Google for Nonprofits. The big thing Google offers in relation to web searches is Google Ad Grants. If you qualify you can receive up to $10,000 in “in-kind” Google AdWords advertising every month! That could create a huge impact on your organization’s digital reach, which could produce positive results in both awareness and donations. Basically you pick some keywords that a searcher might use on Google, then create an advert that will appear on the SERP (search engine results page) based on those keywords. Of course you’re probably not going to be the only company wanting to serve adverts to people who use those particular terms…. If you want your ad to appear at all, you have to bid against other marketers on how much you’re willing to pay Google AdWords every time a searcher clicks on your ad. Obviously the more you pay-per-click (PPC) the more likely your ad will appear in the search results. The whole article, What is Google AdWords and how does it work?, is well worth a read especially if you’re new to search marketing. I personally applaud Google for helping out non-profit organizations get their message out into the world! What about you? Do you use or do you plan to apply for Google AdWord grants? I’d love to hear your stories! Behind every non-profit, there is a story. A reason you either started the organization or why you use your time and energy to support it. One of the best ways to promote your non-profit and cause is to tell that story. Through video, blogs, pictures, and social media hashtags you can raise awareness to your cause through your or other’s stories. Stories should be about real people who need something, hopefully something that YOUR organization provides. Allow the person in your story to have a real name, age, and to speak for themselves. Minds wander, get real quickly. In about 4-10 seconds your listeners tune out if you haven’t grabbed them. Don’t tell me you are going to tell me a story about someone, just tell it. Start with the person’s name, age and a few descriptive words. Keep your story short. Six words to two minutes is the length I recommend. Allow your story to cause me to feel something. Anger, sadness, happiness, pride—it doesn’t matter what the emotion is, I just have to feel something. Your story should have a moment when people see themselves or someone in their own lives. Could be their aging parents, the daughter of the person who made their latte today or their own child. The best stories are told by the person themselves. Clients telling their own stories are the most moving way to share how your organization makes a difference. The short video is both an emotional tribute to his son and other parents of shooting victims and also a call to action for change. Whether or not you support the ideals of Everytown for Gun Safety, their storytelling efforts are impressive, impactful, and very much align with Jacobwith’s storytelling outline. Your story is the soul of your organization, don’t keep it bottled in, let it out and spread your message! It’s here! #GivingTuesday has arrived! #GivingTuesday is a movement born out of the marriage of emerging media and philanthropy. Back in 2012 92nd Street Y and The United Nations Foundation collaborated to start a “hashtag activism” campaign promoting giving to charities on the Tuesday after Thanksgiving in response to the massive consumerism of Black Friday and Cyber Monday. 4 years after its start, #GivingTuesday now has over 30,000 partners in 68 countries, 32.7 million twitter impressions, 15.4 Billion global impressions, and has caused a 470% increase in online donations on the Tuesday after Thanksgiving. These are powerful numbers that have a huge impact on communities across the country. Not just funds are raised on #GivingTuesday, but also awareness of multiple charities and organizations across various forms of social media. The debate is still out on the usefulness of hashtag activism with some critics saying that while it does create awareness of major issues it does not necessarily create tangible results. One of the most recent examples of this is the viral #BringBackOurGirls campaign, which created a massive awareness to the atrocity of 200 Nigerian schoolgirls being kidnapped in April 2014 by terrorists. But even with millions of retweets, hashtags, and selfies later-little to no real action was taken and the public’s attention moved on, the girls are still missing and seemingly forgotten from the public eye. Hashtag activism has been incredibly useful in other cases, such as in the ALS Ice Bucket Challenge. #ALSIceBucketChallenge raised $115 million in 2014. Greatly because there was specific call to action for the social media participant to accomplish – donate and dump water on your head. #GivingTuesday also is successful because of the specific call to action associated with the hashtag. Awareness is great and should be pursued by nonprofits and other organizations through emerging media, but with that awareness action must be put into place for a movement to occur. So, how are you giving today? With the population ever increasingly becoming more attached to their phones it is no wonder that nonprofits are now harnessing the power of mobile technology to help in their fundraising efforts. Through responsive websites, apps, and texting, non-profits are getting their message directly to their target audiences and allowing them to streamline the donation process ensuring a higher volume of funds collected for their endeavors. 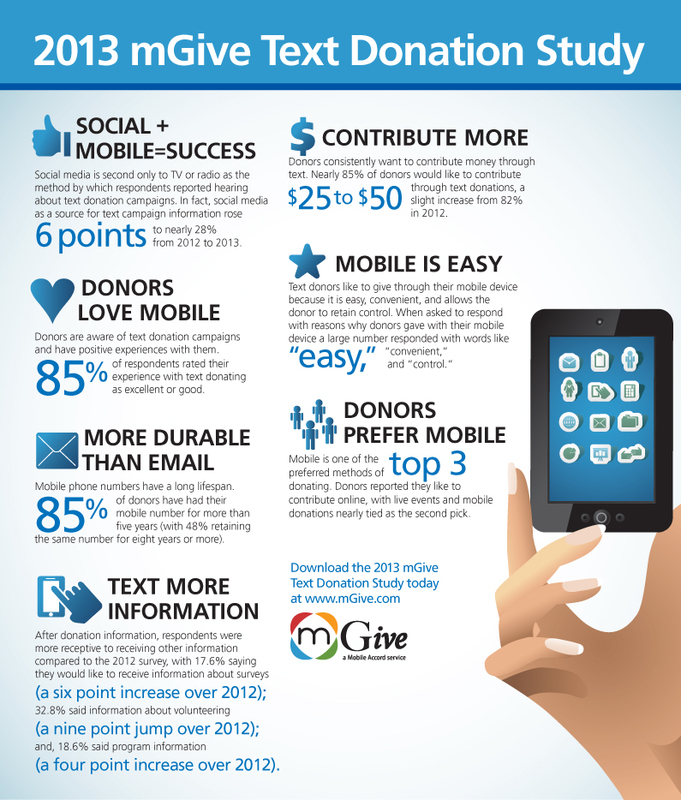 Donors are found to be 34% more likely to give if they can do so on a responsive website. A mobile option such as a responsive, easy to navigate, user-friendly website with plenty of “calls to actions” allows donors to act more impulsively and quickly go through the act of donating. In addition to responsive websites, non-profits have found great success with text based giving. You see it after natural catastrophes and on commercials for various charities, the call to action to “Text now to donate.” The request is followed by an easy to remember number or word/number combo that you can text to donate a pre-determined amount to the charity of your choosing. The Pew Research Center states that The ability to send small donations using mobile phones facilitates “impulse giving” in response to moving images or events. One of the most successful text based fundraising campaigns was that done by the Red Cross to aid Haiti after the devastating earthquake of 2010, $43 million dollars were raised by text donation alone. One of the most valuable things your non-profit can invest in is developing your mobile strategy. If potential donors hear about your organization chances are they are immediately going to Google you on their phones, be sure that the information they find will be easily accessible! Further more you must engage your potential and reoccurring donors by going to where they are – their phones! Your website is the digital face of your organization or campaign. Though funds may be lower than desired for your web design, this is not an area where you should skimp when it comes to price or time. Well designed sites are more trustworthy. People are more likely to stay on your site and learn your story as well as contribute financially if they feel they can trust your organization. Make sure your navigation easily to both find and use. Why do you want people to get involved in your organization? Why should they donate? Put this information up front and center, don’t hide it away! No one likes finding outdated information when they are searching for contacts and events. Make sure your websites information is up-to-date. Being as up-to-date as possible will make your organization current and in turn visitors will be more trusting of the information you are providing. And don’t forget, as this is your organization digital “face,” to show off your personality! Any marketer will tell you, the teen market is huge. They have a big influence on their peers and spread brand awareness and loyalty like wildfire through social media. What if nonprofits could tap into this over-sharing peer influencing market to boost awareness about their causes? They need to look no further than the highly successful truth campaign. The truth anti-tobacco campaign started 1999 by the American Legacy Foundation (now called the truth initiative) to help inspire teens to both stop smoking and never start smoking. By raising the awareness of the dangers of smoking as well as exposing big tobacco companies not so ethical backgrounds, the truth initiative states that teen smoking is down from 28% in 2000 to 9% in 2014. Their newest campaign #FINISHIT seeks to end teenage smoking once and for all. So how does truth reach teenagers? They go to where they are. truth is very active on facebook (2 million followers) twitter (121k followers) and instagram (35k followers) engaging followers in their hashtag campaigns, such as #FINISHIT, to spread awareness. These videos have millions of hits and have been shared thousands of times! What a way to get your message across! The truth anti-tobacco campaign is a long running one, now going on 15 years. It has survived and been amazingly effective because it has evolved with its market. Who knows what the next 15 years will hold for truth, but I’m sure they hope they won’t be needed any longer.